Here it is! A definitive collection of backgrounds, statistics, and information on the heroes and villains from the original Star Wars movie! This comprehensive guide to the Star Wars galaxy details the aliens, Imperials and Rebels that figured in those crucial weeks leading up to the Battle of Yavin. 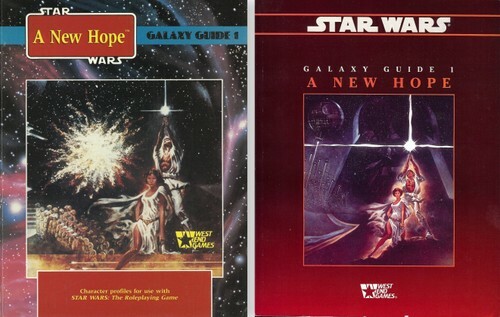 First in a series of guides to the greatest space fantasy film of all time, A New Hope includes character histories and never-revealed-before information that makes this volume a must for movie fans and players of the Star Wars game. • Illustrations by Michael Manley, Ralph McQuarrie and Al Williamson — artist of the Star Wars newspaper strip. • More than 40 non-player characters from Star Wars IV: A New Hope that easily fit into any campaign. • Detailed histories and character profiles of familiar heroes like Biggs Darklighter and Wedge Antilles. • Full backgrounds and personality notes about infamous villains such as Greedo and Grand Moff Tarkin. • Information on strange and wondrous aliens including Sand People, Jawas and the Cantina Band. • Complete character templates for every hero, villain, rogue and Rebel outlined in this volume. • Interviews with famous heroes of the Alliance including Luke Skywalker, Han Solo, and Princess Leia." The fourth moon of Yavin, site of the battle that destroyed the Death Star in Star Wars IV: A New Hope. Bespin's famed Cloud City, the floating paradise from The Empire Strikes Back. These names bring back exciting images from the greatest space fantasy films of all time! And we've captured that excitement in this definitive guidebook to two of the most important systems in the Star Wars movie trilogy. This comprehensive volume details the creatures, aliens, cultures, and geography of both Yavin and Bespin. 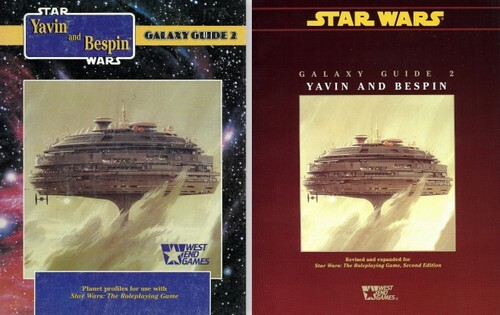 Galaxy Guide 2: Yavin and Bespin Planet Profiles provides newly-disclosed data that will fascinate movie fans and Star Wars game players alike. • Photographs and illustrations from the Lucasfilm archives that bring both planets to life. • Characters that populate these star systems and add complications to any campaign. • Detailed information on Bespin and Yavin's native wildlife. • Overviews of the economic, political, and cultural environments of two vastly different worlds. • Full backgrounds and statistics on new aliens and creatures. • Maps of Cloud City and the Rebel High Command Base on Yavin's fourth moon. • Adventure outlines to help you design game scenarios using these strange and exotic settings. "Here it is! A definitive collection of backgrounds, statistics, and information on the heroes and villains from the second Star Wars movie, The Empire Strikes Back! This comprehensive guide details the aliens, Imperials and Rebels that figured in those crucial weeks centered around the assault on the ice planet Hoth. Explore the middle saga in the greatest space fantasy film of all time with this guide to the Star Wars galaxy! 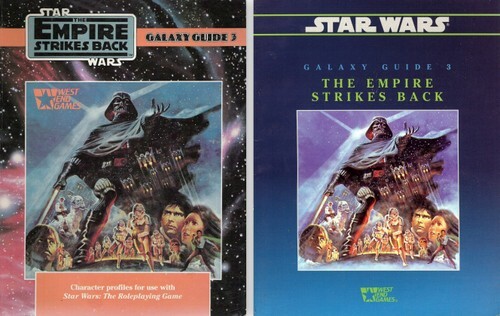 The Empire Strikes Back includes character histories and never-revealed-before information that makes this volume a must for movie fans and players of the Star Wars roleplaying game. * Over 40 non-player characters from Star Wars V: The Empire Strikes Back that easily fit into any campaign. * Beautiful illustrations of every character in this volume. * Detailed histories and character profiles of familiar heroes like General Rieekan and Lando Calrissian. 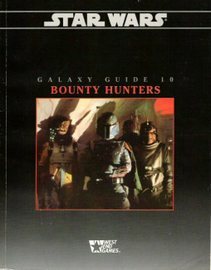 * Full backgrounds and personality notes on bounty hunters such as Dengar and Boba Fett. * Information on the inhabitants of the strange worlds of Hoth, Dagobah, and Bespin. * Complete character templates for every hero and villain outlined in this volume. * Updated information and statistics for Luke Skywalker, Han Solo, Princess Leia, and other major characters." "Aliens! These strange, intelligent, humorous and wondrous beings fill the Star Wars saga with other-worldly excitement. Whether they are recognizable bipeds, insectoids with compound eyes, or gaseous lifeforms that waft in the gentle breeze, alien races make up a huge portion of the Galactic Empire. They fight alongside the Rebel Alliance. They engage in less-than-legal activities throughout the space lanes. They even cooperate with the Empire — willingly or unwillingly. Galaxy Guide 4: Alien Races Character Profiles features many assorted aliens, including information on their planets, cultures, life styles and tendencies. This new information — never before detailed anywhere — will fascinate movie fans and Star Wars game players alike. • Over 30 entries describing familiar and new alien races from the Star Wars galaxy. • Detailed illustrations that bring each alien race to life. • Full descriptions, backgrounds, and game statistics on every alien race in this volume. • Overviews of alien-economics, politics, cultures, and standings in the Galactic Civil War. • Complete backgrounds and statistics for aliens from the Star Wars movies never described before, such as the Kitonak and Whiphid. • Complete information on aliens from Star Wars adventures, including the Charon, Squibs and Sedrians. • Many new aliens never described before anywhere that fill out the Star Wars galaxy. "Han Solo is in the clutches of the infamous gangster Jabba the Hutt. The new Death Star battle station will be operational far ahead of schedule. Yoda dies. Luke Skywalker, more than a man but less than a Jedi, must face his father, Lord Darth Vader. Return of the Jedi, the towering climax to the greatest space fantasy of all time, has begun! Galaxy Guide 5 brings to life the characters from the classic finale to the Star Wars movie trilogy. 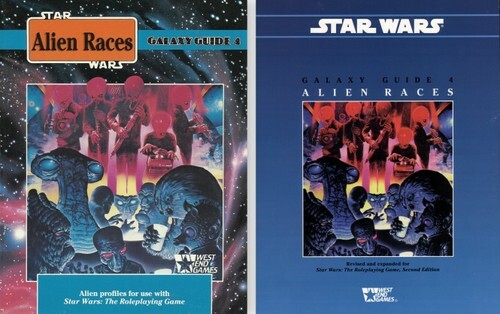 Providing backgrounds, personality sketches, anecdotes and game statistics on the villains and heroes, stars and bit players, humans, aliens, monsters and Droids appearing in Return of the Jedi, this informative and entertaining book will be enjoyed by fans of the movies and players of Star Wars: The Roleplaying Game. • 38 character profiles, covering every major character in the film — from Jabba the Hutt, to the Ewoks, to the Emperor himself. • Detailed illustrations by Al Williamson, artist of the Star Wars newspaper strip. • Maps, floorplans, and diagrams of important locations, vehicles and equipment, including Jabba's sail barge, speeder bikes, and the Ewok village. 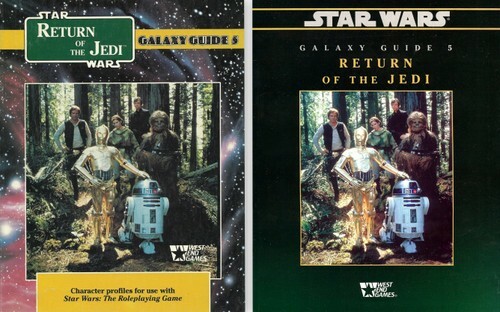 • Complete game statistics for use with Star Wars: The Roleplaying Game. • Updated information and statistics for Luke Skywalker, Han Solo, Princess Leia, Anakin Skywalker, and other major characters." "Features: * Ship construction, repair and improvement rules. * Rules for buying, selling, and carrying cargo. * Rules for trading on the black market. * Rules for loansharks, pirates, and Imperial Customs officials. ~~ Also includes: * A complete setting - the Minos Cluster - where the Traders can begin their new careers. * Pregenerated worlds, characters, and encounters. * A detailed outline of the Minos Campaign, pitting the characters at first against the merciless law of supply and demand - then against the even more merciless Galactic Empire!" "Come explore the infamous pirate spaceport city of Mos Eisley. Pounded by the relentless twin suns of Tatooine, Mos Eisley is host to some of the most famous (or infamous) smugglers and criminals in the galaxy! This book provides a complete overview of this outlaw city. It contains detailed location descriptions, with maps, gamemaster character descriptions and illustrations. 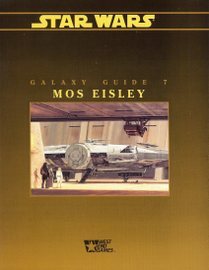 Includes introductory chapters describing the history of Tatooine and Mos Eisley!" 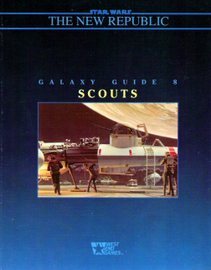 "Designed for use with West End Games' Star Wars: The Roleplaying Game, Galaxy Guide 8: Scouts provides detailed information on many aspects of scout adventures, giving gamemasters and players plenty of information to get started. For players, this book offers an overview of the scout services, discussion of where scouts come from and what they are like, as well as several new templates. For gamemasters, this book covers the story and practical elements of scouts adventures, including hints on how to design new planets and civilizations, natural hazards, and interesting gamemaster characters suitable for a scout setting. This book also has a detailed alien species generation system so gamemasters can "build" fun and exciting new alien species. Finally, this book offers a mini-campaign for new scouts, with adventure hooks, locations, and gamemaster characters to get things rolling right away." "A compendium of trivia, news, rumors and information from the Outer Rim Territories. 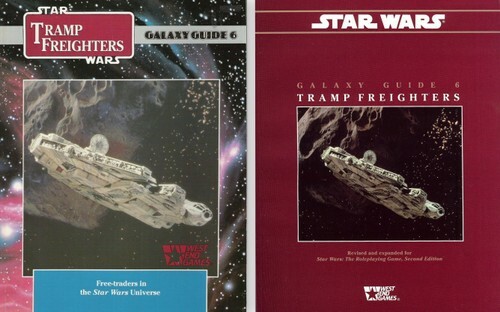 Inside this Galaxy Guide, there are countless new characters, ships, aliens and locations to populate your campaign. Meet some of the most famous Rebel heroes, Imperial despots and dangerous pirates and smugglers in this section of the galaxy. 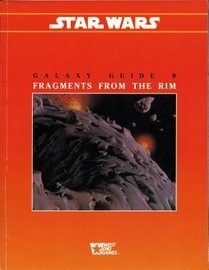 This Galaxy Guide provides gamemasters with a wealth of information about life in the Star Wars universe, and includes chapters on the Rebel Alliance and the Empire, swoop gangs, mercenary units, pirates, corporations, media organizations, the Force, and even music, social life and culture! The perfect supplement to add atmosphere and flavor to your Star Wars game." The very mention of a hunter on your trail is enough to make your blood run cold. They are the galaxy's most infamous trackers and will hunt another person halfway across the galaxy if the credits are right. This Galaxy Guide examines all facets of the most dangerous and possibly most misunderstood group of professionals in the galaxy. Within this volume, players and gamemasters learn the specifics of bounty hunting, from determining "acquisitions" to the specialized equipment that hunters rely on. This guide provides details on some of the more notable hunters operating in the Empire, as well as details for generating bounty hunter player characters, including an introductory adventure." Slaving, spice mining, smuggling, gun-running... whenever there is a demand for a product - any product - there is someone who will supply the goods, no matter what! From huge crime bosses to low-life thugs and slavers, criminals have a large influence on the Star Wars galaxy! As the Galactic Civil War between the New Republic and the Empire continues, the forces of law and order face a struggle to control the growth of crime. 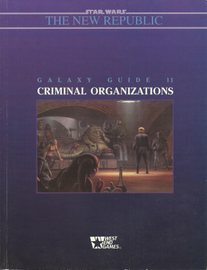 From independent operators to crime syndicates and the awesome Hutt kajidic, this Galaxy Guide provides a valuable reference for everyone who wants to incorporate the galactic underworld into their adventures." "Snaggletooth. Ephant Mon. Weequay. Nikto. Though only glimpsed in the Star Wars movies, their unique appearance - their alienness - makes them some of the most memorable characters from this grand adventure. From the seedy Mos Eisley Cantina to the poshest cruisers plying the Galactic Core, they are an important part of the Star Wars universe. Aliens have civilizations spanning a million worlds, each with its own culture and history. 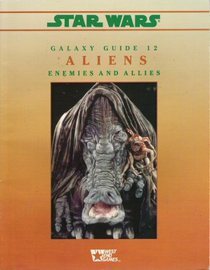 Galaxy Guide 12: Aliens - Enemies and Allies describes over 30 alien species, with illustrations and complete game statistics."